We’d love your help. Let us know what’s wrong with this preview of The Habit Fix by Eileen Rose Giadone. 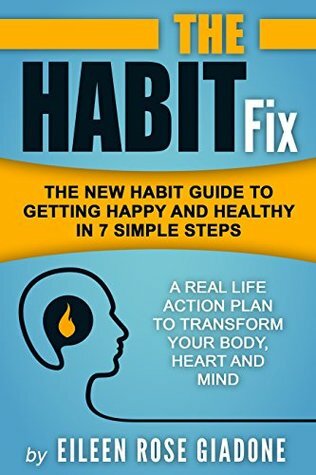 "THE HABIT FIX, part motivation, part road map, this book will take you there." A no-nonsense, 7-step, guide using the power of habit for self-improvement, good health, confidence and happiness. If you’re ready to leave behind old habits that have been weighing you down but don’t know where to begin,The Habit Fix has a big, bright a Change your habits, change your life. If you’re ready to leave behind old habits that have been weighing you down but don’t know where to begin,The Habit Fix has a big, bright arrow that points to “START HERE”. If you’re serious about swapping a lifetime of unhealthy habits for good, healthy habits but can’t see a clear path through, The Habit Fix will guide you, and you''ll enjoy it! Simple, Go-To Habits That Work In Your Busy Life Our habits create the framework of our lives. Changing a lifetime of habits can seem overwhelming and time consuming, but this book offers quick, go-to habits that bring immediate change, a step at time. If you think your bad habits are deeply ingrained and too powerful to overcome, this book offers 7, simple new habits that show you deep habit change and a healthy lifestyle is possible. It targets 7 key areas of life and offers 7 highly effective habits for personal growth that have brought profound improvement and success to thousands of people like you – KEYSTONE HABITS that help you on your way to a healthy habit lifestyle. Don’t Break Old Habits, MAKE New Habits! The Habit Fix is not loaded with idealistic principles and doesn’t dwell on all you’ve done wrong in life. We hear enough of that already! It takes the focus off that tired, old tradition of analyzing your “bad” habits, lifestyle and lack of motivation. It’s not about the arduous task of breaking old habits but instead, embracing fresh, new, keystone habits that dissolve the old ones naturally. With 7 new keystone habits, this book offers a positive approach that avoids the trap of negative self-judgement and taps into our natural confidence and healthy self-esteem. Ideas That Work, Put to Immediate Practice This is a practical guide with specific, credible information for habit building for a healthy lifestyle that can be put to use right now. It’s not filled with theories, poetry and feel-good platitudes. It has real, proven tactics for building healthy habits now and direct links to trustworthy, self-improvement techniques. These are tactics that are actually effective and not just marketed effectively. Start with 7 new keystone habits in this first book of The Habit Fix Series and build on them later with The Habit Fix 2: QUICKSTEP. Keeps You On Track To Your Goals This book will help you create habits that last but don’t require a huge amount of time and brain power. It’s for those seeking deeper evolution and a vibrant, healthy sense of well-being for life-permanent healthy lifestyle habits for REAL change. To ask other readers questions about The Habit Fix, please sign up. The book was well written with links to other books, blogs, videos and sources of relevant information. The author fulfilled her statement of purpose of naming and explaining seven simple steps to transform your body, heart and mind. I was gifted the Kindle edition of this book by BookBub and highly recommend it and give it 5 stars. The author gives good, no nonsense advice and backs it up with links to well known and respected websites. Rational arguments. Bonus: Only one typo noted! I have read this book twice and each time I learn something new about myself. It is an easy read. Down to earth information. I have enjoyed reading this book and plan to follow this author. This book offers many ideas on making small changes in your life that will have big effects. Choose one and go with it. I know it helped give me ideas that are definitely doable. Puts you off. There are many theories, statistics, and behavioral studies, and while they are short(ish) with links if you are interested, they are still there. A promise to the reader broken is Mixed emotions here. A promise to the reader broken is a trust, of sorts, broken and that’s a hard pill to swallow. A promise broken aside, this book has helpful tips and it’s a quick read. There are plenty of resources to other websites to help you along on your journey- however, this is USA based- primarily. The tips are people based the links are USA based. Will I be reading any more from this author: no probably not- while this book was generally fine- it didn’t capture my attention like other books. I do much of the steps recommend. Yoga and exercise are things that have helped me keep healthier. I am committed to lifetime learning since I enjoy it so much. There is more but read this book and see for yourself. Eileen Rose Giadone is an author, singer, songwriter and professional honky tonk girl. She wrote the self development book, Amazon Best Seller, The Habit Fix. The second book in the series, The Habit Fix 2: Quickstep, also became an Amazon Best Seller. Her first illustrated children's book, Natasha The Party Crasher, was released in February 2016. She is currently putting the final touches on a cr Eileen Rose Giadone is an author, singer, songwriter and professional honky tonk girl. She wrote the self development book, Amazon Best Seller, The Habit Fix. The second book in the series, The Habit Fix 2: Quickstep, also became an Amazon Best Seller. Her first illustrated children's book, Natasha The Party Crasher, was released in February 2016. She is currently putting the final touches on a crime mystery novel set in New York City. Eileen Rose is also a singer, songwriter and professional performer in Nashville, TN. She has released 11 self-penned, roots/rock albums worldwide and has toured all over the world. She performs regularly with her traditional country band, The Silver Threads, at her highly acclaimed residency shows in Music City, Nashville TN. Eileen also tours throughout the US and Europe. Her albums are available on Amazon, I-Tunes and where all good records are sold. Born and raised in Boston, Massachusetts, Eileen lived in the United Kingdom for many years and now currently resides in Nashville, TN.